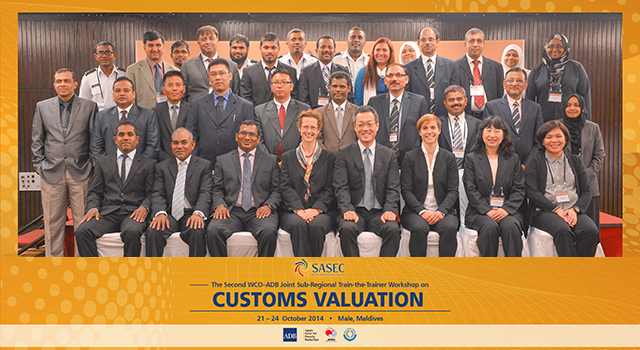 This World Customs Organization-Asian Development Bank (WCO-ADB) Train-the-Trainer Workshop on Customs Valuation was held on 21-24 October 2014 in Male, the Maldives in follow-up to the first WCO-ADB Joint Subregional Workshop on Customs Valuation held in Colombo, Sri Lanka in February 2014. Both workshops were initiated under a joint subregional train-the-trainer multiyear assistance initiative on Customs valuation implemented by ADB and WCO Asia Pacific Regional Office for Capacity Building (ROCB A/P), and were designed to support participating countries’ efforts to strengthen efficient management of Customs valuation control through the use of post clearance audit. enhancement of trainers’ skills and capacity in training methodologies. In addition to the formal outputs of the Workshop, participants unanimously adopted an abbreviated name for the multiyear assistance initiative – “V6 Customs” – reflecting both the valuation process (“V”), and the six SASEC Customs administrations (“6”). Trainer’s skill and methodology: Ms. Benedicte Meille, Learning and Education Manager of the WCO Capacity Building Directorate, shared practical training approaches and tips taking into consideration learning styles; training cycles; the roles of the trainer; learning objective, and more. Participants delivered 10-minute presentations on Customs valuation, putting the acquired trainer’s skills and methodology into practice, and received practical feedback from the trainer and other WCO accredited experts. Discussion on the potential added value of regional cooperation in Customs valuation control: Mr. Ismail Nashid, Assistant Commissioner of Maldives Customs Service and accredited WCO officer, reviewed the WCO Guide to the Exchange of Customs Valuation Information; Ms. Maki Kitaura, Senior Inspector Customs Clearance from the Government of Japan, reviewed the WCO Guideline on the Development and Use of a National Valuation Database as a Risk Assessment Tool; and Mr. Rajendra Singh, Additional Director from India’s Central Board of Excise and Customs introduced India’s Customs valuation control, paying particular attention to their Customs valuation database and Customs valuation information exchange procedures. Discussions centered around the most efficient and secure way to exchange Customs valuation information; and how to share experience and practical know-how on Customs valuation control. Progress Report on National Action Plans, and Refinement of Action Plans: The SASEC delegations refined their respective national Action Plans to ensure realistic and achievable goals for implementation at the national level to enhance the proper management of customs valuation. Continuous communication among participants, experts, ADB, and ROCB A/P through the WCO Member Website, to move ahead with the project. inform ADB and ROCB A/P of follow-up activities conducted, to contribute to the building and sharing of good practices and lessons learned. Mr. Ahmed Zuhoor, Commissioner General of Maldives Customs Service, delivered the welcoming remarks, where he highlighted the Workshop as a good opportunity for all members to deepen their knowledge on valuation control. He was supported by Ms. Rosalind McKenzie, Regional Cooperation Specialist, South Asia Regional Department, ADB, and Mr. Takayuki Miyoshi, Customs Cooperation Fund/Japan Operation Manager and Program Manager for South Asia, ROCB A/P. Delegates included representatives from the Customs administrations of Bangladesh, Bhutan, India, the Maldives, Nepal, and Sri Lanka. The workshop was facilitated by resource persons from Japan Customs, the Maldives Customs Service, WCO, and experts from ADB and ROCB A/P.